This year, we had a quiet (yes, social media free) holiday season, and to be honest, it was relaxing. Just the three of us, opening presents on Christmas day, with hot chocolate, Archie comics and the couch, a simple but delicious Christmas dinner, some good wine and a twinkling tree. And a peaceful holiday is what our family needed after a hectic year. It was a great year, for sure, and my life changed hugely from month to month. But it was when I was lying on the couch, absorbed in my Christmas present (for curious cats, it was a couch blanket and the Life with Archie series, best present ever) I realised that there is nothing like spending time with the child and partner, watching them build Lego and do puzzles, drifting in and out of sleep, and it made for a particularly relaxed end of the year. However, I do enjoy socialising too, and I am lucky to be surrounded by incredibly supportive friends and colleagues. It has been a year full of ups and downs, and the ups were the friends I made and old friendships that blossomed into deep, enduring bonds. I can't believe that just about five years have passed since we upped and moved from England. While I still get homesick for both India and England, I love my life here and everything it has brought with it. So here is to another year, filled to the brim with memories and taking chances. I teamed up with one of my dear friends Lillian of Beyond Umami and the Dairy Farmers of Canada for this post. Holiday entertaining can be stressful, but the DFC have put together a beautiful collection of appetizers and desserts for this season, and asked Lil and I to check out a couple of their recipes. I picked these delicious Mediterranean cheese fritters. With creamy ricotta, fresh herbs, olive tapenade and hot tomato sauce, these are a cinch to put together and look gorgeous with their pretty colours and deeply savoury, cheesy, tangy and fresh flavours. These are perfect for my New Year's entertaining. Check out Lillian's 'Exotic Artichokes with Gouda'. They look so good. As this year comes to an end, there are a few changes coming to this website. I've been doing this for almost seven years now, and The Tiffin Box has evolved and grown and has offered me more opportunities that I could have ever hoped for or dreamed of. So what's in store for the future? Let's just say, that's for you to find out soon. In the meanwhile, time to check out the recipe for these yummy, cheesy treats from the Dairy Farmers of Canada. 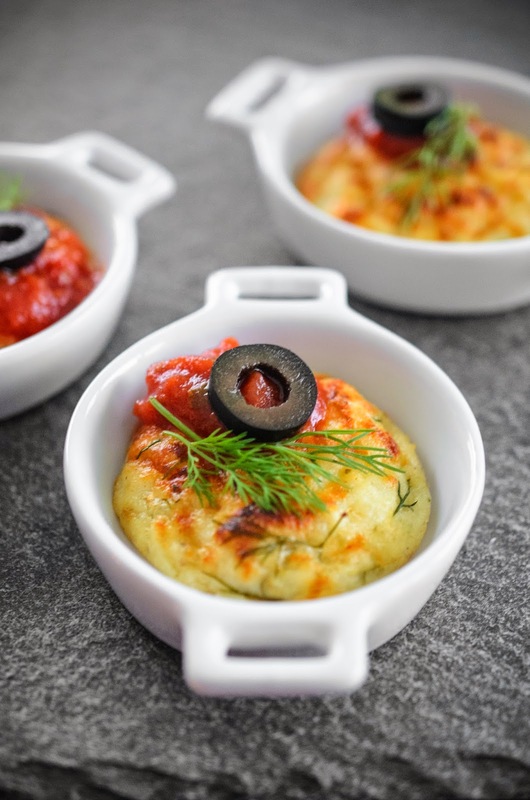 Recipe: Mediterranean Ricotta Cheese Fritters. Disclosure: Lillian and I were provided with the ingredients for this recipe. However, I was not compensated monetarily for the post. Glad to hear you had a lovely Christmas, and I'm looking forward to hearing what's next for you :-). Happy New Year!! I think having a social media light holiday is one of the best ways to recharge. Sounds like 2014 and 2015 are both going to be great years for you! 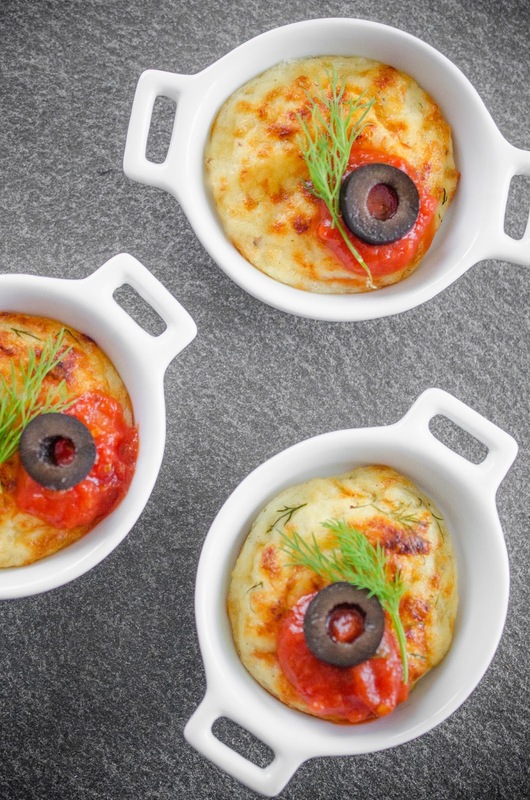 These look like really yummy appetizers, and I love those cute little dishes! Happy New Year!